From Inverness, we meandered south to Edinburgh, stopping overnight in Ballachulish (near Glen Coe). 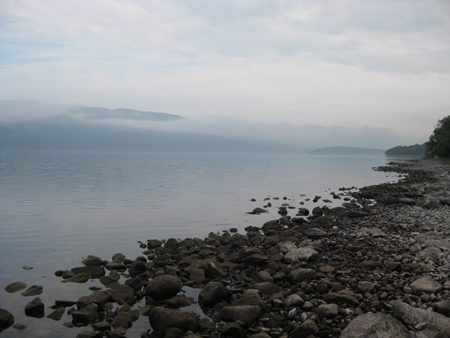 This time, we drove down the east side of Loch Ness, along the more picturesque, less populated B862. Again, because it was early in the morning it was very quiet and the Loch looked lovely and misty. We stopped at Foyles and did two short walks – one to the Falls of Foyles (which weren’t quite as Robert Burns described them) and the Red Squirrel Walk (didn’t see any red squirrels). But the walks were pleasant, nevertheless. After this, we continued past the interestingly-named Loch Lochy, and then stopped to look at the Commando Memorial (“in memory of the Commandos who died in the Second World War”) and enjoy our first view of Ben Nevis. 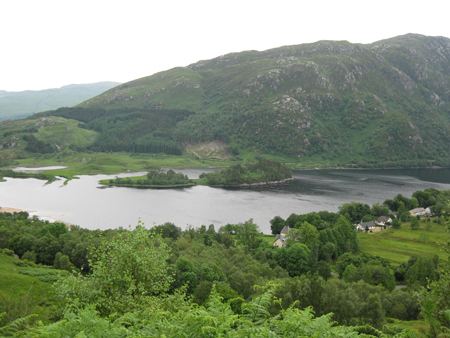 We then detoured slightly west, to go to the village of Glenfinnan on the shores of Loch Shiel, where (historically) in 1745 Bonnie Prince Charlie raised his standard to signal the start of the Jacobite uprising; and also where the (fictional) Connor Macleod was born in 1518. There is a column by the edge of the Loch, commemorating the Jacobites, but it looked like you had to pay a an entrance fee to get to it, and we figured that the National Trust of Scotland had had enough of our money the day before at Culloden, and the Glenfinnan Visitor Centre would be covering the same set of events as the Culloden one, so we decided to give it a miss. Instead, we continued on into Glenfinnan, and had lunch at the Glenfinnan Station Museum, in a converted railway carriage (originally a Dining Car). They very helpfully gave us a map of walks in the area, so we did the first part of the Viaduct Viewpoint path, which ran all the way from Glenfinnan to the 21 arch viaduct crossed by the West Highland Railway (as seen in the Harry Potter films). We only went as far as the viewpoint, where we got a magnificent view of the Loch in one direction, and an in-the-distance view of the viaduct in the other. On leaving Glenfinnan, we retraced our route back towards Ben Nevis, and into the start of Glen Nevis. We parked in the “Braveheart” carpark and did a short and not very interesting walk. We would probably have done better to drive further into the glen, but time was getting on and we wanted to get to the B&B we had booked in Ballachulish. 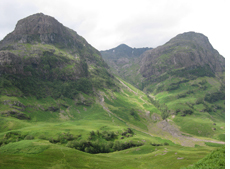 After checking in to the B&B, and offloading our luggage, we drove on into Glen Coe and did a couple of walks – one from the Visitor Centre, and then another (better) one to Signal Rock. According to the information board, tradition has it that Signal Rock was the gathering point for the MacDonalds of Glencoe at times of emergency, and some people believe that a fire was lit here to signal the start of the Massacre on 13 February (though there is no evidence to support this). Regardless of whether this is true or not, there was a wonderful view from the top of the rock. The next morning, we drove on through Glen Coe and Rannoch Moor, stopping (frequently) to enjoy the views. We then drove through part of the Trossachs National Park, which was quite pretty, but not a patch on what we had seen earlier in the day. We stopped at Balquhidder to see Rob Roy’s grave, and at 13th century Inchmahome Priory, which is on an island in the Lake of Menteith (the only lake – as opposed to loch – in Scotland). A little 12 person boat regularly ferries people across the lake to the island. Our final stop for the day was Stirling Castle. We got there at about 3:00, and as we arrived it started to rain lightly. The air smelled as if an enormous great thunderstorm was brewing, but fortunately this failed to eventuate. However, it was still sprinkling when we went into the castle and joined one of the free guided tours. The tour guide was amusing and informative, and we really enjoyed it. We went through the Great Hall and the Chapel (where the infant James VI was baptised), but the Palace was closed as it was still being restored. Part of the restoration work includes the weaving of new tapestries for the Palace walls: they are basing them on a six-tapestry series of a unicorn hunt (allegory for the Crucifixion and Resurrection) and the four completed tapestries were hanging inside the Chapel. We went down to the Tapestry Room, where you could actually see the weavers working on the new tapestries, and read some information about them: the kind of research that had been done, the changes that had been made, etc. One nice feature is that they aren’t attempting to age them at all: when the Palace is reopened, the tapestries on the walls will be as rich and vibrant as they would have been when the Palace was actually in use. 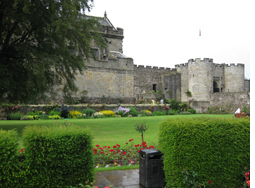 Stirling Castle was the first place we had been to that showed signs of really heavy tourist activity happening. However, because we had arrived later in the day, the numbers were thinning while we were there, and while it didn’t end up deserted, it certainly wasn’t crowded. Even better, by the time we were leaving, the rain had cleared up completely, so we were able to get photos of the views, and of the Wallace Monument in the distance. We were spending the night in Edinburgh, but we had been warned that it would be best to arrive after 6:30, to avoid traffic congestion, so we grabbed a quick meal in Stirling (confirming that British Chinese Restaurants are still underwhelming) before heading to Edinburgh.